For Christmas this year, I got a pasta machine that I've always wanted, and finally got to make my first batch of ravioli with my mom. We made this a little while back but haven't had the chance to share the recipe until now. It's another Michael Symon recipe and it was just as delicious as you'd expect from him! I don't have a link to share since it's from his cookbook, so I typed all of the instructions below. I recommend a couple glasses of wine with this one, as it was definitely time consuming (but a labor of love). 1) Before prepping the filling, put the ricotta in a fine-mesh strainer and set over a bowl to drain (preferably overnight) in the fridge. 2) In a large bowl, stir together the ricotta (without the liquid), Parmesan, egg, orange zest, salt and pepper. Cover and refrigerate while you prepare your dough. 3) If using a pasta machine, divide the dough into four chunks and roll each through the machine on the widest setting. Repeat until the sheets end up being about 4-5" wide and 18" long. 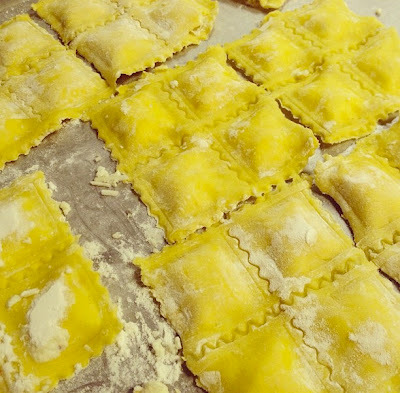 4) If you have a ravioli attachment (like we did), follow the instructions to fill them that way. If not, lay the sheets out flat on a countertop dusted with flour. 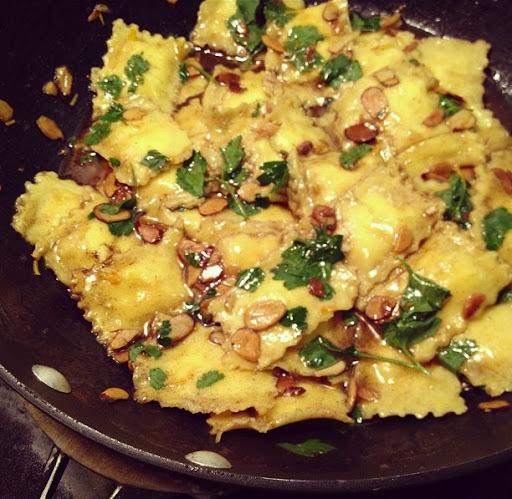 Along one long half of each sheet of pasta, place four 2-teaspoon size dollops of filling. Moisten the edges of the pasta with water, fold the unfilled side of the dough over the filled side, and press around the perimeter of each mound to seal. Using a round ravioli or 2-inch cookie cutter, cut out the ravioli - you should have 12 to 16 raviolis at this point. 5) Bring a large pot of water to a boil, and salt it enough so it tastes seasoned. Add ravioli to the water and boil until the float. Once they float, cook for 1 minute longer. 6) While they're cooking, you can prep for the sauce. In a large saute pan, heat the butter over medium-high heat until it starts foaming. Then add the sliced almonds and saute until golden brown, about 2 minutes. 7) Scoop the ravioli from the cooking water with a slotted spoon, leaving excess water clinging to the pasta (this helps forms the sauce), and transfer into the saute pan. Add the orange juice. Toss once or twice until the contents of the pan are well acclimated. 8) Remove the pan from the heat, add the parsley and orange zest, divide into bowls and serve. I cannot get over that you made that gorgeous pasta! What a great recipe. Thanks for sharing.